The Urban Aeronautics X- Hawk, a fully redundant, twin-engine aircraft designed by Rafi Yoeli in Yavne, Israel is one of the unconventional solutions which can be very useful in rescue operations. This vehicle is designed to comply with the present FAA certification standards for ‘Powered Lift’ category and has the size of a large van. 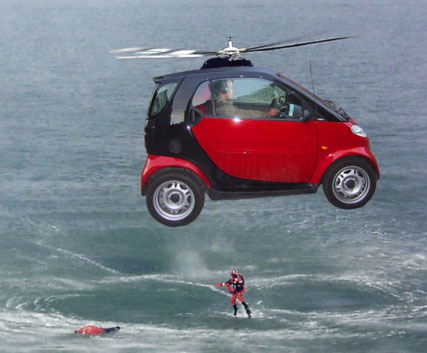 The Urban Aeronautics have patented the design as Fancraft. the X-hawk has also a smaller unmanned version The Mule. Urban Aeronautics claim X-Hawk to be very useful in military role that requires transportation of small units of troops to specific locations. Specifically where the use of helicopter is practically useless for example in urban settings and also when land transport may be dangerous as in case of land infested with IEDs. In situations which require the entry of troops at or from difficult junctures like a narrow street or windows of buildings at any level. Along with this the X-Hawk would be able to accomplish strategic war-missions. X-Hawk may also be used for medical evacuation and rescue missions for civilian operation as in a disaster or war situation. Besides X-Hawk would be useful for executive transport. The military machine is equipped with many special technical features related to design to fulfil its purpose. Besides being ‘rotorless’ (no exposed rotors),it is equipped with ‘fly-by-wire’ multi channel ‘flight control system’ enabled with automatic stabilisation for accessing different levels. It is more safe and ‘significantly’ noiseless than helicopter and promises more predictable and fast arrival time and minimal landing zone requirement. The MedEvac facility would ensure aerial medical care to be given promising immediate care and thus reduced mortalities.